HARBISON is named for Anne Harbison, affectionately known as the grandmother of Greensboro. Along with breathtaking views, traditions and people are part of what makes Vermont's working landscape special; we're proud to honor Ms. Harbison's contribution with this cheese. 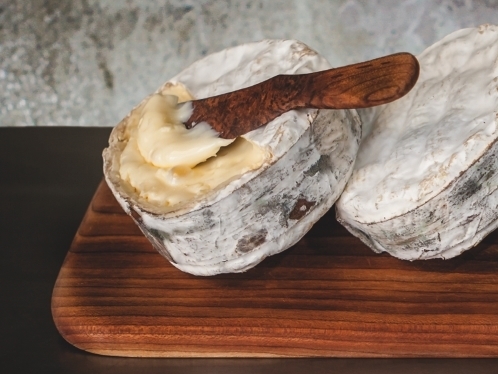 SENSORY NOTES - Harbison is a soft-ripened cheese with a rustic, bloomy rind. Young cheeses are wrapped in strips of spruce cambium, the tree's inner bark layer, harvested from the woodlands of Jasper Hill. The spoonable texture begins to develop in our vaults, though the paste continues to soften on the way to market. Harbison is woodsy and sweet, balanced with lemon, mustard, and vegetal flavors. PAIRING AND SERVICE - Harbison is a great excuse to gather a few friends and scoop into a decadent treat. When a bit younger, the bark can be peeled away for sliced portioning. If the bark has fused with a more loosened paste, then the best approach is to leave the bark intact and spoon out portions from the top. Pair with oaked white wine, or barrel-aged sour beer. Fruit mostarda and crusty bread make nice accompaniments. Harbison is made by Jasper Hill Creamery and matured by Cellars at Jasper Hill.